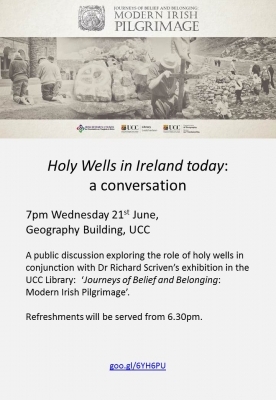 ‘Holy Wells in Ireland today: a conversation’ is an event I am holding in conjunction with my exhibition in the UCC Library ‘Journeys of Belief and Belonging: Modern Irish Pilgrimage’. Several speakers, including a local authority official, researchers, and explorers, will start the seminar, followed by a public discussion exploring the role of holy wells. This event hopes to consider the rich place of holy wells in local communities and in Irish heritage. It is on at 7pm Wednesday 21stJune, in the Geography Building, UCC. Refreshments will be served from 6.30pm.